HAB45 gets recognition for our work in Play! Last week, Kaboom! recognized our awesome work in their Community Highlight section of the Map of Play website (pictured below). Kaboom! 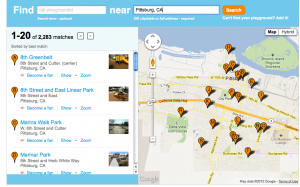 ‘s Map of Play is an online user-generated list of local parks and play spaces. 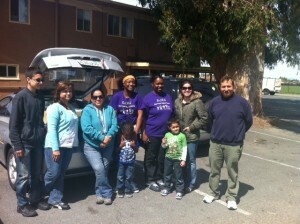 Healthy & Active Before 5 with the help of local parents has entered information for the City of Pittsburg. By entering Pittsburg, CA into the ‘near’ field, you can find the location of local parks, details about play equipment, amenities, transportation and even restrooms! 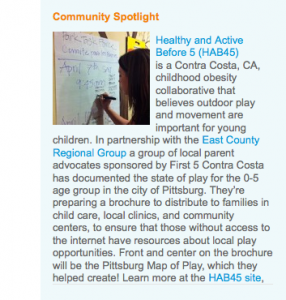 In the Map of Play on Kaboom!’s website, enter “Pittsburg, CA” into the ‘near’ field to find a list of local play spaces. We couldn’t have done it without help. Parent members of the East County Regional Group (sponsored by First 5 Contra Costa) have been visiting Pittsburg parks with their families and sharing their opinions with us. In addition to the new and better web listings, we plan to have a paper brochure for those without easy access to the internet. The brochures will be distributed to families at child care homes, local clinics and community centers. ECRG parents gather at Ambrose Community Center after the first park assessment session. Visit Kaboom! Map of Play to see our Community Highlight which will be up for the rest of the week. Also check out the local parks in your area. You can even download a mobile phone app, Playgrounds! which uses your smart phone’s GPS or a zip code to locate playgrounds near you. Don't be afraid to play outside! partners, play, success Kaboom!, parks, Pittsburg, play. permalink. Building Blocks for Kids helps build new healthy habits.